Have you made your vacation plans for the summer yet? Are you thinking of a road trip to the Grand Canyon? If you are, I highly recommend you drive out to the Grand Canyon Railway in Williams, Arizona. 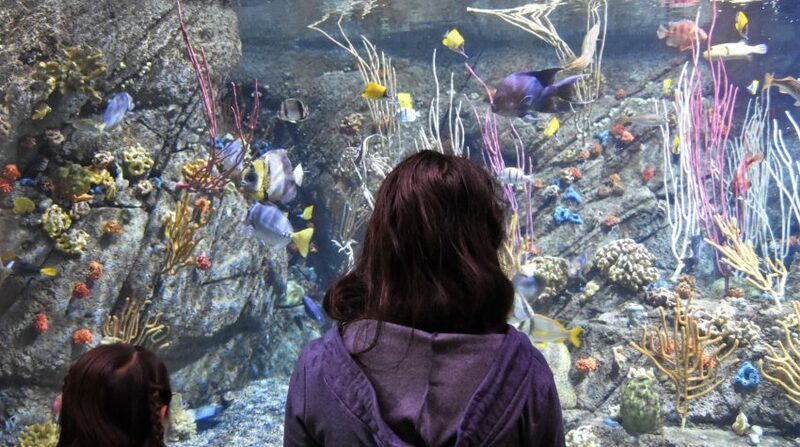 The kids will love it and it is an experience truly like no other! 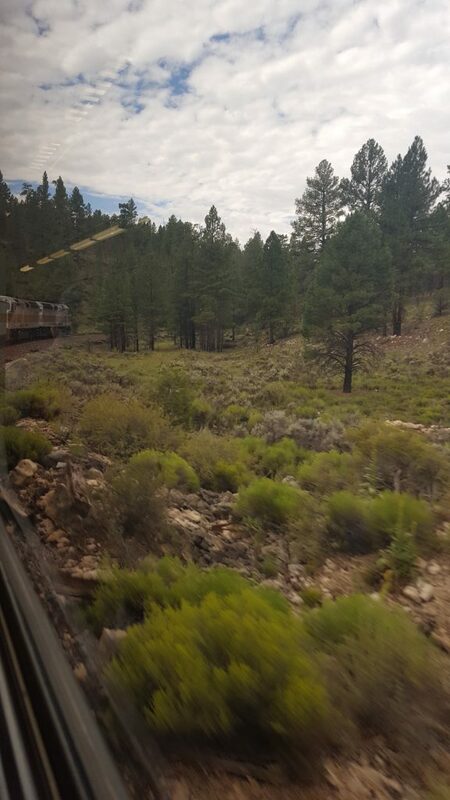 The Grand Canyon Railway is a train that takes you from Williams, Arizona, through a beautiful forest for an hour ride until you hit the Grand Canyon. The train ride alone is enough of a selling point, in my opinion. Before I continue, I want to give a big thank you to my friend Jennifer for recommending this trip! We booked our stay through the Grand Canyon Railway official site. We went with “The Canyon Discovery Package” and I will be sharing my experience with this package. There are different packages available through the Grand Canyon Railway site. You might also want to see if you can get an Automobile (AAA) discount if you are a member. 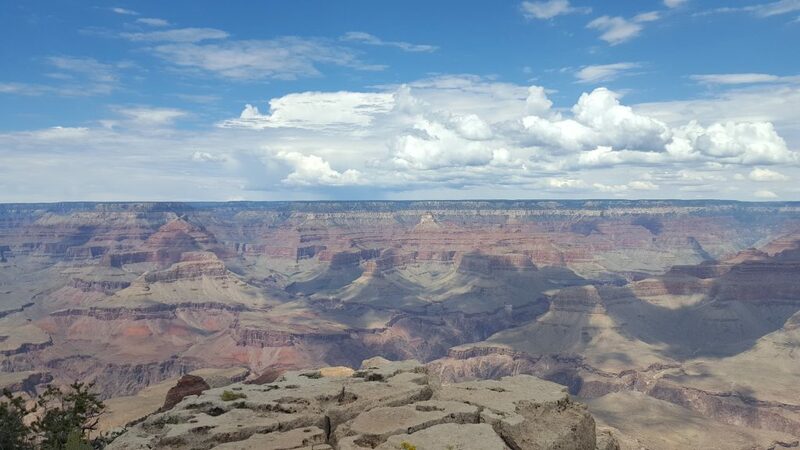 Our package included a 2-night stay at the Grand Canyon Railway Hotel. This hotel is located in Williams, Arizona and is situated right next to the train you will take to the Grand Canyon. When you first enter the hotel, you feel like you are entering into a lodge. There is a grand fireplace with seating areas in the main lobby. The room itself was clean and decorated in a modern style. We were comfortable just staying in our room after the long drive. Did I mention there was a huge thunder and hailstorm when we arrived? Well, the energy went out at one point for about 20 seconds after a big flash of light. However, the power all came back on right away and it was business as usual. This hotel seems to be prepared for these scenarios. We also made use of the indoor pool. The kids loved this feature. We were able to go swimming even though it was pouring rain and there was lightning all around. There was also a game room, but we did not make use of it. Our stay at the Grand Canyon Railway Hotel included a meal package for breakfast, lunch, and dinner. Prior to arrival, I was not thrilled that I was going to eat off of a meal plan. However, I soon realized that it is a very small town and the food options are limited. Can I just tell you though- the food was actually great! It was buffet style and had plenty of good options. I am not a buffet person. I avoid them like the plague because I can’t eat enough to make up for the cost and I feel that the food quality rarely seems very good. I was pleasantly surprised that the food was great and the entire family found something that they liked. I also enjoyed dining in the hotel because there was live music every night. There was always a man with a guitar singing to the diners. They were a real treat and I think that the Grand Canyon Railway Hotel got it right by including this feature in the dining area. The Railway puts on a show prior to visitors boarding the train to the Grand Canyon. We just walked across the way to see the show. 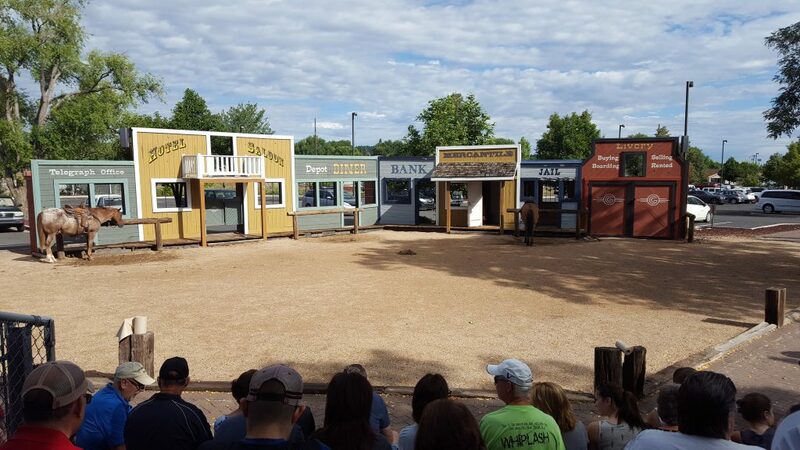 There is an Old West façade set up along with horses. The show involves a family of robbers and it is entertaining. The kids loved it and got a picture with the actors after the show. On our walk to the train, there were plenty of photo opportunities with board cutouts and signs. I took advantage of one. Taking a minute for a photo opp. As you would expect, the train runs on a tight schedule and you need to go straight there after the show. Pay attention to the car number on your ticket to ensure that you are waiting in line for the right one. Note: There are varying levels of train cars that you can ride. We opted for the coach class car with air conditioning and liked it just fine. There is a pullman car advertised on the site in which you get to feel what it’s like to ride a 1923 train. The site states that you can open the windows to let the fresh air in. Hmmm…kind of sounds to me like this car does not have air conditioning. I would pay the extra money for the air conditioning folks! 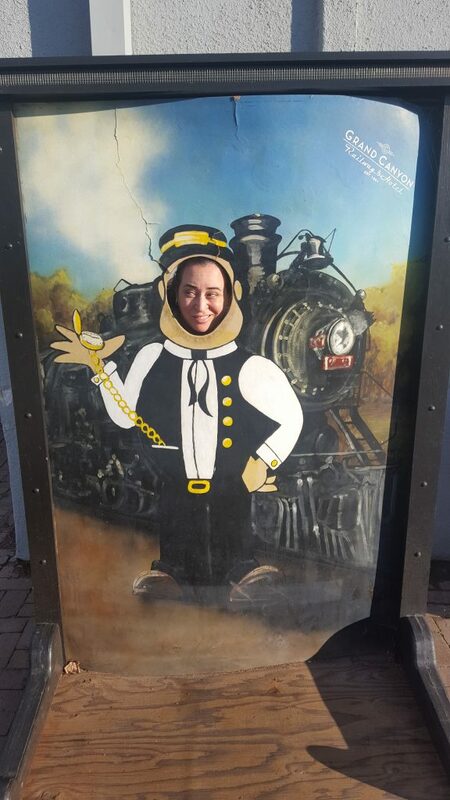 You will be greeted by your host/hostess upon entering your train car. Our hostess was “Kathy with a K.” I can’t believe I still remember her name, but that is how entertaining she was! 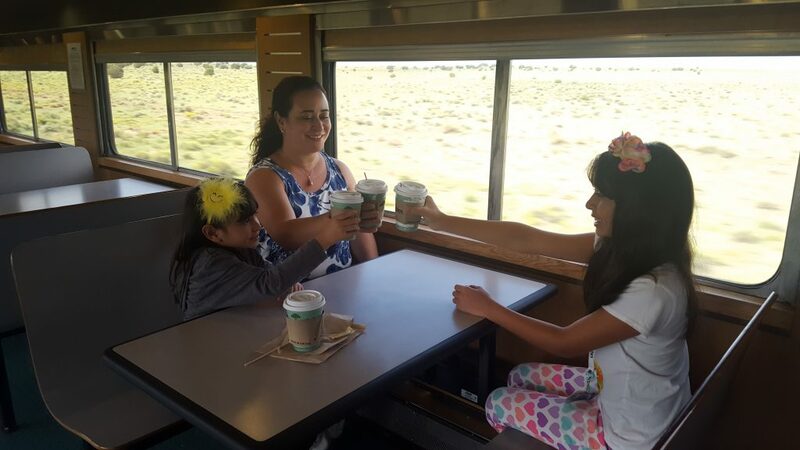 Our hostess gave us some fun facts about the train itself, the local area, and what we could expect once we reached the Grand Canyon. You really do have to have a charming personality to have this job! Our hostess at the front of the car talking about our trip. The train ride itself was comfortable and had beautiful views. The train winds through a forest where you will see plenty of trees and possibly an animal or two. Scenery from the Grand Canyon Railway Train. View of the train going through the forest. Our package included a guided bus tour of the Grand Canyon. We hopped off the train and walked over to the designated bus for our tickets. Everyone on the train did not go to the same bus, so pay attention to where your host/hostess tells you to go. Kathy told us the best seats on the bus are in the back. They are higher up and you see the Grand Canyon as you are pulling up. Kathy was right! These were the best seats. Our bus driver talked about the history of the Grand Canyon as we drove on the road to see the Canyon itself. He also made sure to point out animals that were visible in the forest. The bus driver took us to a few key spots along the Grand Canyon to get out and take pictures. He even stopped by each group of people as they looked on or took pictures to give us some more history about the Grand Canyon. It was nice to get that extra bit of information. Grand Canyon Pic. This picture does not do the scene justice. After we were done with the bus tour, we were taken to a lunch buffet. Just like the hotel, this one was good and had food that everyone in the family would like. The only downside is you have to deal with the big line of people on the bus to get your food. Note: There are several other options for the Grand Canyon Railway tours. Some people did not take the tour bus. Other people made arrangements in advance to stay in the cabins on the Canyon. I cannot speak to that experience, but I can tell you that a friend of mine did this with her family and they all had a blast. “Kathy with a K” proved priceless on the ride back from the Grand Canyon to the Railway Hotel. At this point, the kids were tired and the thrill of riding the train was no longer fresh and new. Kathy had plenty of games to keep the entire train car busy. She had some jokes to share as well. Guess what else happens on the train ride back? 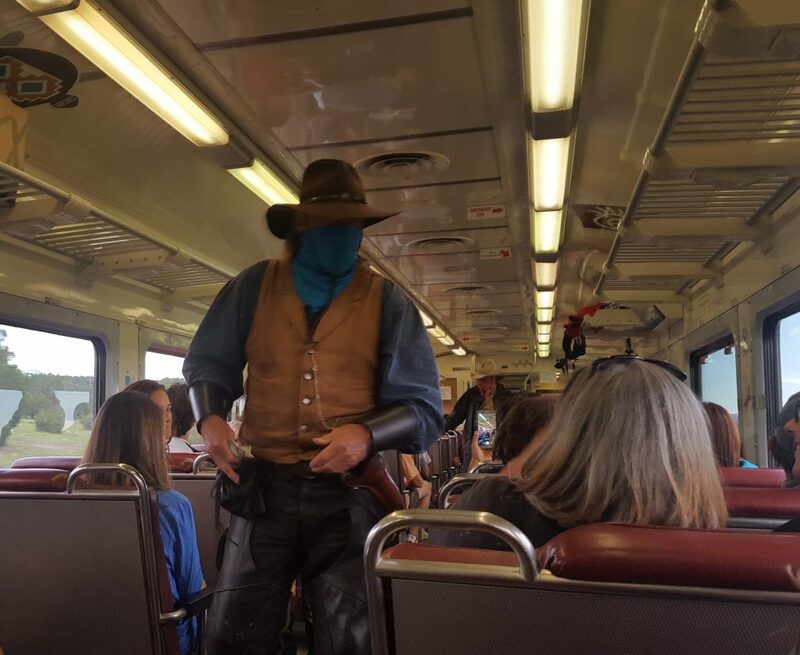 There are train robbers! Remember those robbers from the show before we boarded the train? They came back. They ride up on horses and board the train. The robbers walk through the train demanding that people give them money. 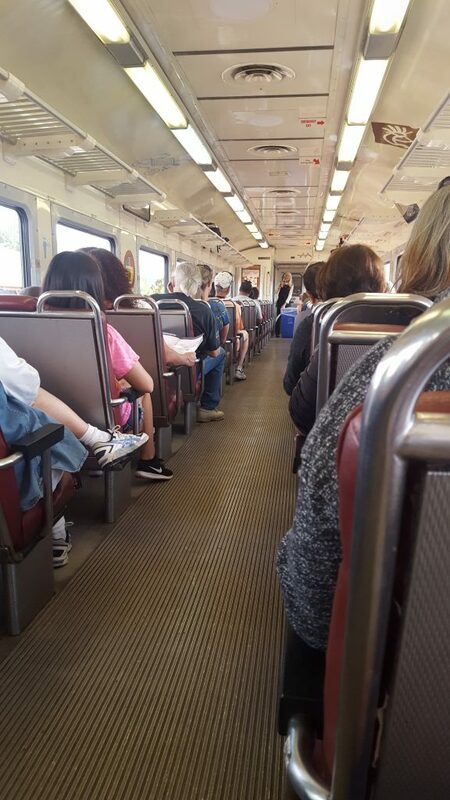 They’ll go up to a few people in the train and it is fun for everyone on board. It’s all in good fun and I think these guys definitely earn a tip. Train Robbery on the way back to the Depot. We went at the end of August when it was burning hot everywhere. We got to Williams, Arizona and it was cold, raining, hail storm, you get the picture. I told everyone to bring a sweater, but not everyone listened. This meant we had to buy a pricey sweater for the youngest because it is a small town and we were in a hurry that morning. I recommend you take a backpack and stuff these things in there. The weather was kind of wacky when we went. It’s nice to be comfortable at all times. You can find some inexpensive raincoats in compact packages at the dollar store. I know, this one should be obvious. Unfortunately, our camera broke right before we left and we ran out of time to get another one. Plan wisely my friends! you’ll need to make this reservation at least a year in advance. If you do happen to do the donkey trip, make sure you are prepared to send something home via mail with the special post office stamp that you can only get if you are staying at the bottom of the Canyon! Take some travel games, books, notepads, etc. Although “Kathy with a K” was a stellar hostess, she still needed a break every now and then! Make sure you take something to entertain yourself and the kids on the train ride. Pack a swimsuit if you want to use the indoor pool. Work in a drive through Sedona Arizona on the way to the Grand Canyon, and a trip through Las Vegas on your way back to SoCal. I will post my ideas for these trips at a later date. The Grand Canyon Railway has an annual Polar Express experience. I have not been, but I have heard rave reviews about it. Kids that have watched the Polar Express and love it would probably get a kick out of this trip. However, tickets sell out fast so you need to reserve them early. 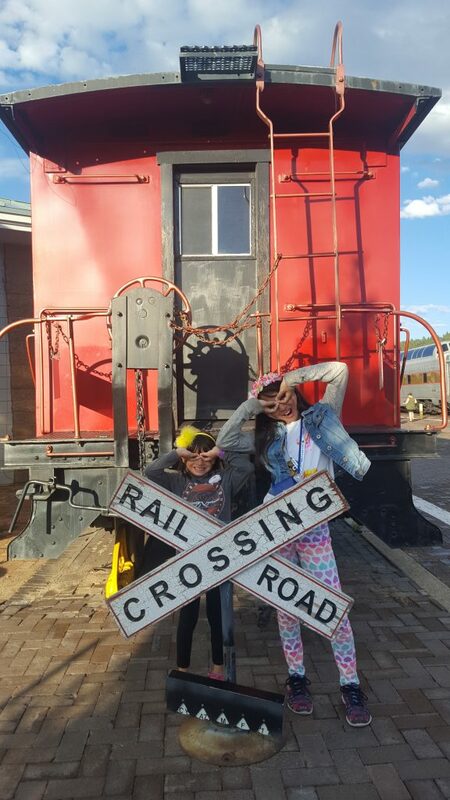 I hope that you enjoyed reading about our trip to the Grand Canyon via Grand Canyon Railway and Hotel. It is truly an experience that your family will not forget! The kids having a great time posing after the trip on the train. 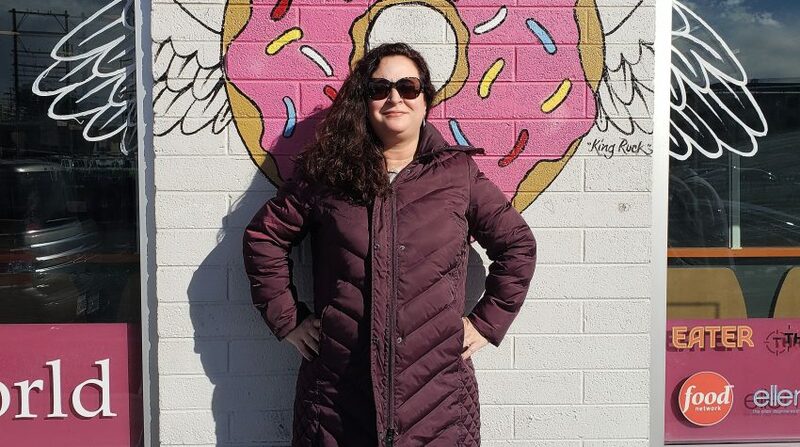 For some more travel ideas, check out our EPIC Road Trip Itinerary: Los Angeles to San Francisco, and Great Wolf Lodge Anaheim: Is it Worth It? Please take a moment to SUBSCRIBE (down below) and follow us on social media. « AMC 4-Pack Ticket Giveaway!